While working on Rails project I often find myself wanting a visual representation of my model classes. ?I usually grab a notebook and manually write them out. Depending on the project, it can take time. I started searching for a diagramming tool that might be easier and faster than writing out by hand, there are a bunch of them out there. ?Most have a steep learning curve and are expensive. A bit of searching around the web for a Ruby-specific tool lead me to a gem named rails-erd. ?Maybe you have heard of it, maybe I’m the last to know, but regardless it is a nice find. Don’t forget to run the bundle command. When the rake task runs, watch the output from the tool. It tells you items you won’t find on the diagram either because it’s not used or a relationship isn’t right. 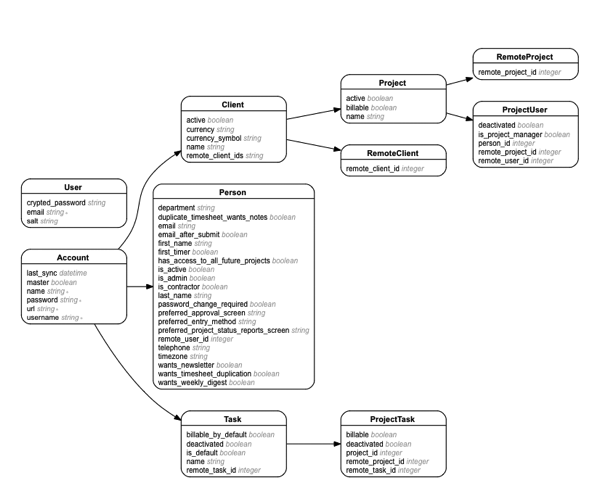 The result will be a PDF file in the root of your project that looks something like this:? As you can see, it gives a very nice model diagram with all the relations and properties. Just what I was looking for. The tool is very customizable and the web site outlines everything that can be changed. ?I haven’t looked very much at this aspect since it produced everything I needed the first time.